Selling 3+ Cargo Cards at a port where the goods sold are 'in demand'. 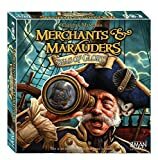 Glory Cards can be played to help your Captain or make things troublesome for your opponents. You are limited to a hand-size of 4 Glory Cards. You may still draw a fifth card and decide which of the five cards to discard. At this point it is forbidden to play Glory Cards, regardless of what the card says. In other words, you may not draw a fifth card and then play it or any of the other cards on your hand. You must first decide which 4 cards to keep. Unless stated otherwise on the card, you can play Glory Cards freely during your turn, except during combat. Here only cards meant for combat can be played. Some cards are played during another players turn. If you wish to play such a card then announce it when the card says it must be played (without revealing the specific card). Other players may now announce if they also wish to play cards at this point. Players place their announced cards in front of them. Resolve the cards in turn order, starting with the current player. A player may decline to play his announced card once it's his turn, but must reveal the card he intended to play. Some Glory Cards (and a small number of missions and rumors) give you the option of hiring Specialists. Specialists are masters of their trade and enhance your Captain's ability to stay at the top of his game. There are 8 types of Specialists. Carpenters, Gunner Captains, Master Gunners, Surgeons, Lookouts, Masters-at-Arms, Pursers and Sailing Masters. There are two of each type available in the Glory Card deck. 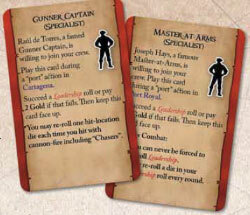 On each Specialist Glory Card is listed what you need to do or pay in order to hire them. Once hired, place the card face up on your Player Board. You may employ any number of Specialists, but only one of the same type.